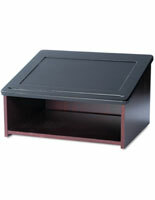 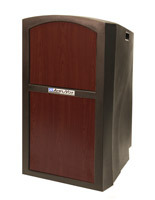 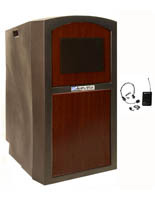 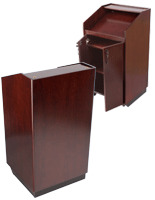 Mahogany podiums display the handsome warmth of this real wood species. 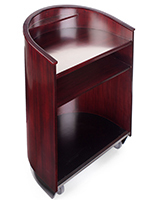 With its even grain and deep red/brown color, mahogany is a common, yet richly colored wood used in furniture making for generations. 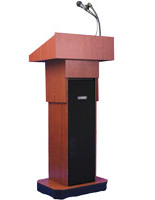 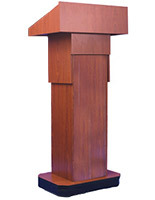 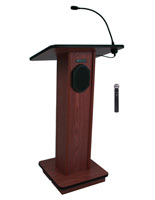 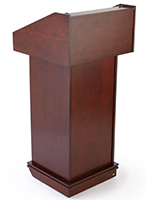 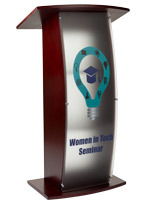 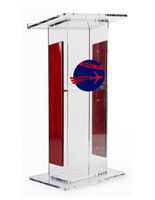 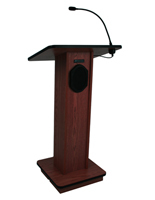 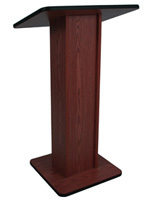 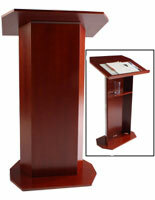 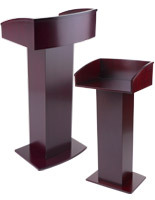 The material is a natural for podiums and lecterns thanks to its durability and beauty. 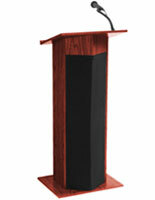 The wood is also a "tonewood" used in the manufacture of musical instruments. 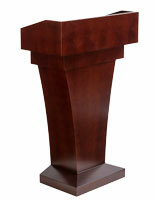 But the name of the game here is podiums. 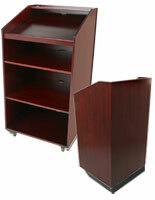 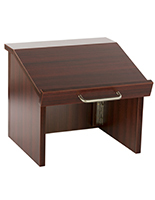 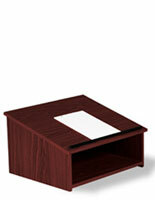 Depending on the model, the mahogany finish is either veneer or plastic laminate. 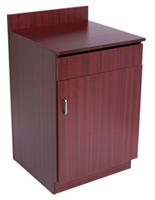 Veneer is a thinly sliced layer of real mahogany wood adhered to a paper substrate that is glued to plywood or other manufactured panel. 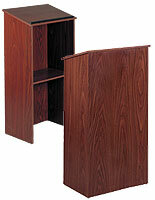 Once sealed with clear coats such as polyurethane or lacquered finishes, the natural beauty of the wood comes through. 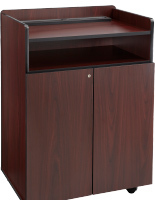 Plastic laminate is just that, a faux wood finish that offers the appearance of real wood. 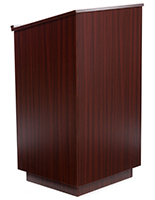 While the veneered surface offers the highest quality, the plastic laminate models offer a more durable and scratch-resistant finish that is often much more affordable in price. 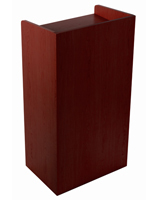 Keep this in mind however, from a distance of just a few feet the difference between veneer and plastic laminate is negligible. 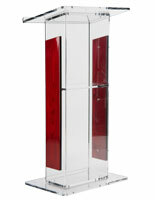 Two distinct styles of podia are offered, solid panel construction or models with acrylic front panels. 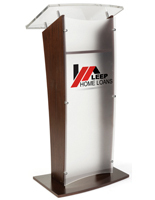 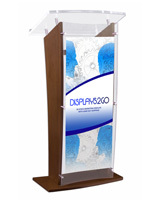 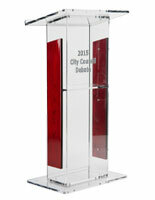 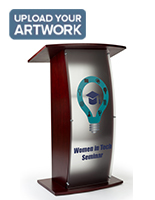 We offer custom artwork and logos we can apply to the face of the acrylic panels to personalize your podium. 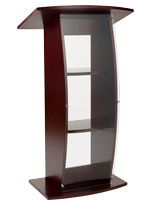 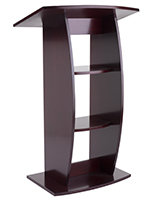 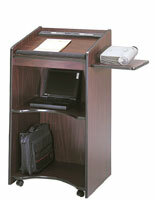 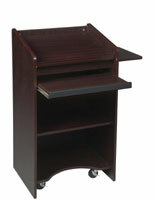 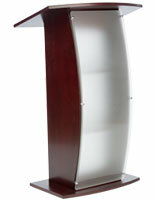 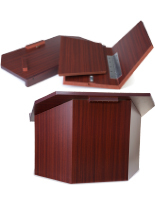 If you need extra storage space, choose a lectern with internal shelves and doors. 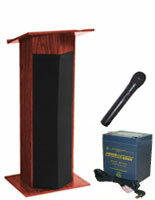 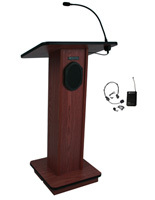 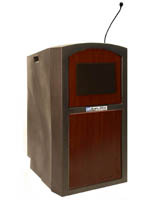 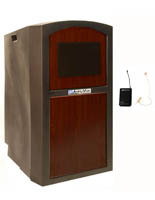 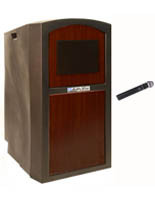 For the complete package, amplified podiums with wired or wireless microphones provide adequate hearing for those sitting in the rear of the room.